Articulations started with a good idea and a love to create beautiful things. 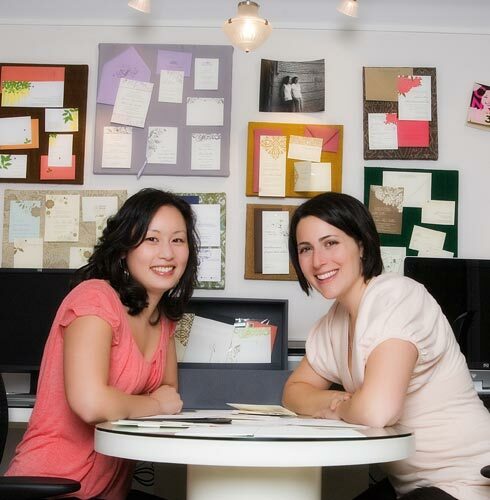 After planning our own weddings, we took the leap in 2004 and quit our jobs to devote ourselves to making custom stationery for weddings. Our little portfolio of custom invitations grew until we finally created our Wedding Collection, soon followed by our Holiday and Baby Collections. Today we are a full service stationer, offering ready-to-order and custom designs. Based in Chicago, Articulations has worked with clients locally, nationally and internationally. We pride ourselves on expertly guiding our clients through the vast selection of paper, ink and design options available. We see our role as educators, offering clients guidance not only on color and design schemes, but also on invitation etiquette, planning advice and the best ways to use the wedding budget. Articulations specializes in producing fine letterpress printed stationery. Letterpress printing, a method dating back to the 1400s, uses a raised, inked surface to press into a sheet of paper. The results are one-of-a-kind artisanal pieces printed in relief, leaving an impression you can see and feel. The process is labor intensive, requiring the pressman to feed one sheet of paper at a time through the press by hand. However, the finished creation speaks for itself: a piece of stationery whose quality of craftsmanship is incomparable. To achieve the highest quality print impression, we use 100% cotton, tree-free, paper, specially produced for letterpress printing. Our envelopes are manufactured with recycled paper containing at least 30% post consumer waste. We endeavor to make our stationery products as eco-friendly as possible without sacrificing or compromising quality. © 2019 Articulations LLC, All Rights Reserved.